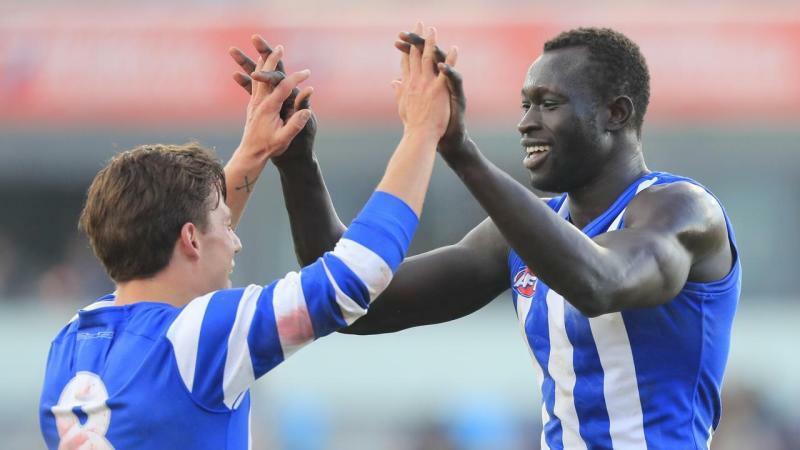 Majak Daw is back at North Melbourne with the AFL defender joining his teammates for their annual photo day. Daw returned to the club a couple of weeks ago and a slight limp on Monday was the only sign of his serious injuries suffered in December, when he fell from the Bolte Bridge. The 27-year-old suffered hip and pelvis injuries in the fall and it is unclear whether he will play this season. Daw had a broad grin at the team photo session and captain Jack Ziebell said the Kangaroos are rapt to have him back. "He's loving being back at the footy club as well, which is awesome to see," Ziebell said. "A footy club is a great place to be around and no doubt Maj is enjoying his time at the moment. "He's going to look forward to getting stuck back into some training and getting his body right again. "We're pumped to have him back." The Kangaroos skipper said it is several days since Daw ditched his crutches. "He's moving pretty well, as everyone saw today, so we're just ecstatic he's around the boys and I think he's pretty happy with that too," he said. "Everyone is just joyful that he's back. The smile on his face, more importantly, but (also) on everyone else's faces when he walked in, it's awesome to see. "You can't make that sort of stuff up, it's pretty cool." Daw's incident put the focus back on mental health in the AFL and he said in a public letter that he had been blessed with a second chance at life. "There is a big focus in the AFL on the mental health space and our club has been great, the support that Maj has received and our footy club has received," Ziebell said. "There is definitely change occurring behind closed doors, which is great for everyone." But Ziebell is unsure when Daw will play again. "We'll have to wait and see. I know he really does want to play but he has to jump a few hurdles," he said. Ziebell will lead an unchanged leadership group at North this season, with Robbie Tarrant, Shaun Higgins and Jamie Macmillan his deputies. The North captain said he has recovered from a calf injury and hopes to play in their two pre-season games.